Hockey players from the University of Maine and Boston University take to the ice at Frozen Fenway on Saturday. 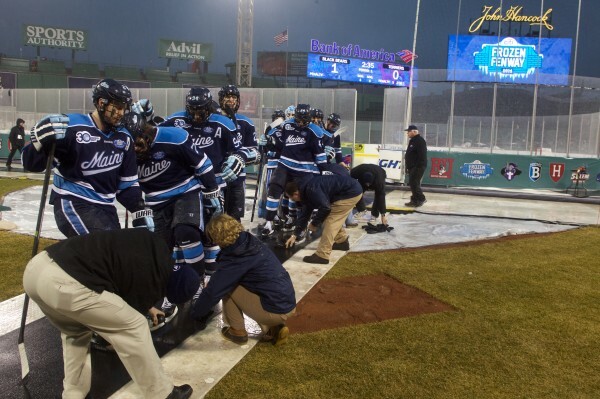 University of Maine players leave the ice as the game at Frozen Fenway is halted due to rain, thunder and lightning on Saturday. 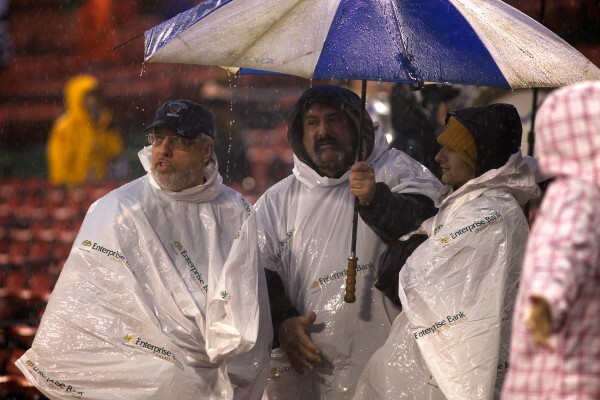 University of Maine Hockey fans gather under an umbrella as the game at Frozen Fenway is halted due to rain, thunder and lightning on Saturday. University of Maine's Ryan Lomberg celebrates after scoring a goal in the first period of a hockey game Saturday against Boston University at Frozen Fenway just before a rain delay was called. 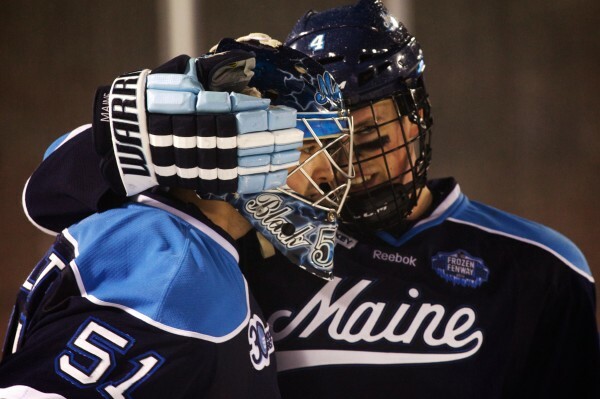 University of Maine's Jake Rutt (right) hugs goaltender Martin Ouellette after beating Boston University at Frozen Fenway in Boston on Saturday. 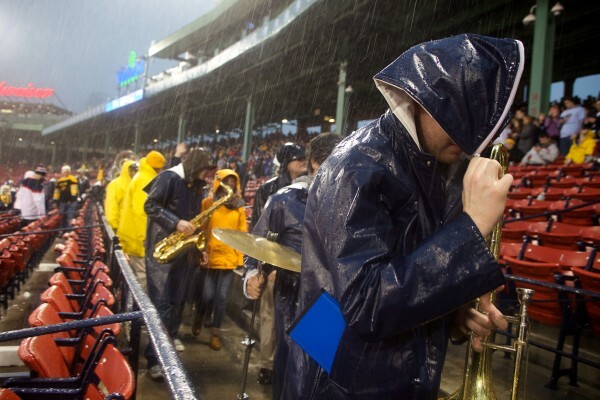 The University of Maine band leaves the stands in a downpour at Fenway Park on Saturday during a hockey game between Maine and Boston University. The game was delayed for an hour. 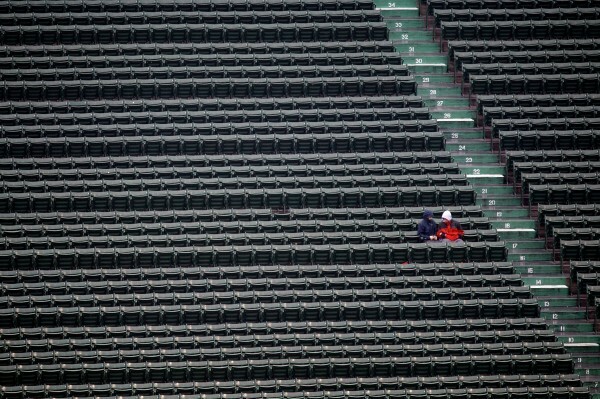 A pair of spectators occupy the bleachers at Fenway Park Saturday during a hockey game between the University of Maine and Boston University. Official attendance at the game was 25,580. Junior Stu Higgins of the University of Maine hockey team slaps the puck through a puddle on the ice at Fenway Park Saturday night in Boston. The game was halted for an hour due to rain and lightning. Junior Stu Higgins of the University of Maine hockey team fights for the puck with Boston University's Ahti Oksanen Saturday night at Fenway Park in Boston. Freshman Cam Brown, of the University of Maine Black Bears, skates down the ice with the puck at Frozen Fenway Saturday night in Boston. Maine beat Boston University by a score of 7-3. Senior Mark Anthoine of the University of Maine climbs out of the tunnel at Frozen Fenway in Boston Saturday night for the start of the third period against Boston University. The Maine Black Bears went on to win by a score of 7-3. BOSTON, MASSACHUSETTS -- 01/11/14 -- University of Maine hockey's Andrew Cerretani scores a goal against Boston University Saturday in the first period at Fenway Park in Boston. Maine went on to win by a score of 7-3. 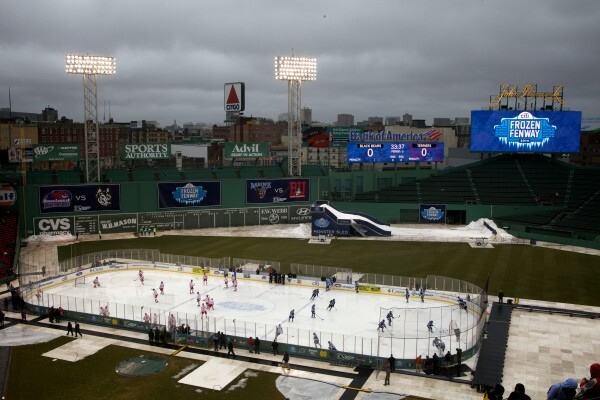 The University of Maine had to overcome more than the Boston University Terriers to pick up a valuable 7-3 Hockey East win at Fenway Park in Boston on Saturday. The Black Bears and the Terriers were subjected to steady rain, torrential downpours and a 70-minute delay due to thunder and lightning. Right wing Ryan Lomberg, defenseman Ben Hutton and center Devin Shore each notched a pair of goals and Andrew Cerretani had the other as Maine built a 5-0 lead through the first two periods and withstood a furious three-goal rally by BU in the third period before sewing it up with a pair of empty-net goals. Maine improved to 11-7-2 overall, 5-2-1 in Hockey East, while the Terriers fell to 7-11-2 and 2-5-1. It was BU’s fourth straight loss and extended its winless streak to six games (0-5-1). Maine is now 2-0 at Fenway Park, beating archrival New Hampshire two years ago. 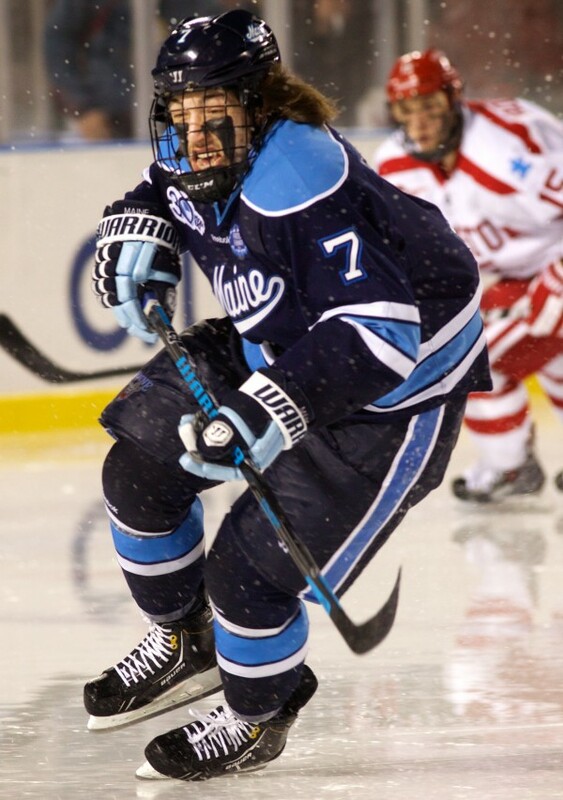 Maine also swept BU this season, winning 7-0 at Alfond Arena on Nov. 15. Lomberg, Hutton and Shore’s first goals came on the power play as Maine snapped a five-game power-play drought (0-for-7). Maine scored on its first three power-play chances while building a 4-0 first-period lead. Maine went 3-for-6 with the man advantage while BU went 1-for-8. “We played really well, especially to come out and build a 5-0 lead,” said sophomore Shore, who extended his points streak to 11 games with his two goals and an assist..
Lomberg opened the scoring 6:37 into the game by finishing off a play involving Cam Brown and Mark Anthoine. Brown dropped the puck to Anthoine, who made a nifty cross-ice pass to the unattended Lomberg in the middle of the slot. Lomberg took a stride and beat Matt O’Connor through the five-hole. A minute later, the delay occurred as crews had to scrape water off the ice before play could resume. Just five seconds after the delay, Hutton expanded the lead. Shore won a faceoff to Connor Leen, who gloved the puck down and passed it back to Hutton at the left point. Hutton’s wrister through a maze of bodies beat O’Connor. “That was a pivotal goal. We just come out of the break and go up 2-0,” said Gendron. Cerretani made it 3-0 at the 15:07 mark when Brown flipped a little backhand pass to him as he broke in alone on O’Connor. Cerretani pulled the puck to his backhand and tucked it past the goalie. Just 48 seconds later, Brice O’Connor faked a shot and slid the puck to Shore at the outer edge of the right circle. Shore wheeled into the shot and fired a rising wrister through a posse of players into the far corner past the screened O’Connor, who was then replaced by Sean Maguire. Lomberg scored the only goal of the second period as he pounced on a Dan Renouf rebound and snapped a 20-footer past Maguire. “[Renouf’s] shot hit a skate and came right to me. My eyes lit up. I put it five-hole again,” said Lomberg. Maine appeared to have the game in hand but the Terriers scored three times within a span of 6:33 to pull within 5-3 with 5:06 remaining. Garrett Noonan beat Maine goalie Martin Ouellette to the glove side with a one-timer from the top of the left circle; Nick Roberto tipped an Ahti Oksanen point shot past Ouellette on the power play and Cason Hohmann nudged a rebound over the goal line after deflecting it off Ouellette. But Hutton scored into the empty net on a clearout from 200 feet and Shore added a shorthanded goal into the vacated net from the left-wing boards. Hutton’s goal was his ninth and he now leads the nation’s defensmen in goals. Anthoine and Brown each had two assists while Roberto had an assist go with his goal and Danny O’Regan had two assists. Ouellette finished with 31 saves while O’Connor and Maguire combined for 31. Maine lost sophomore right wing Steven Swavely in the first period after BU’s Sam Kurker stuck his leg out and tripped him. BU was without injured left wing Evan Rodrigues and defenseman Matt Grzelcyk, who were the team’s third and sixth-leading scorers last year.